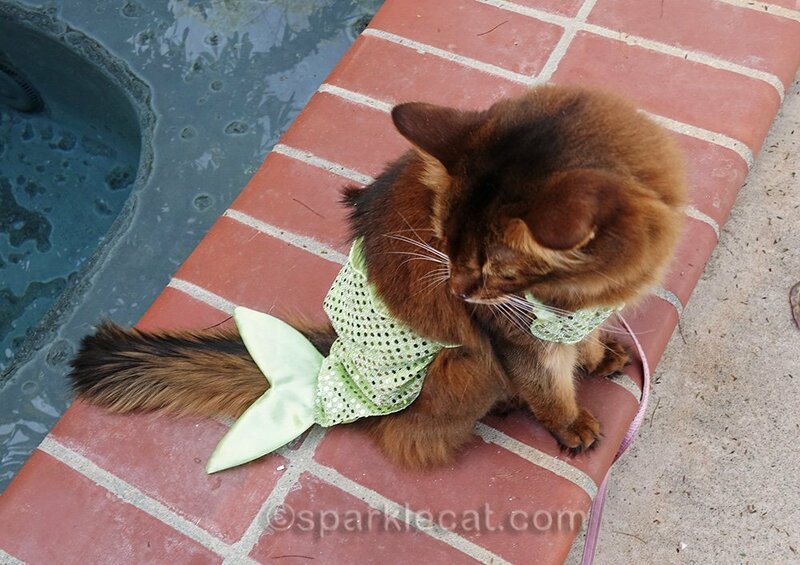 You may remember a couple of years ago, I modeled this mer-kitty costume. Yes, I thought it was silly too. It even wound up on the cover of my 2018 Outtake Calendar. But you know the craziest thing about this costume, other than anyone designing it in the first place? It was actually a hand-me-down! Sometime near Halloween, 2013, my human brought it home. Sparkle did not like it any more than I did. In fact, she pretty much hated it. As you can see, Binga was in the background, silently judging. Which she should not have been doing. My human had a second costume, waiting just for her. BINGA OF THE PHAROAHS !!! PS I can SEE what Spakle didn’t like it…..
Love the shot of Binga! Sorry you and Sparkle both disliked that costume, Summer. But that last frame and comment about Binga … MOL MOL MOL! Poor Sparkle. Is that Angel Truffles on that package? Binga looks even more adorbs than usual. MOL!!! These are funny. 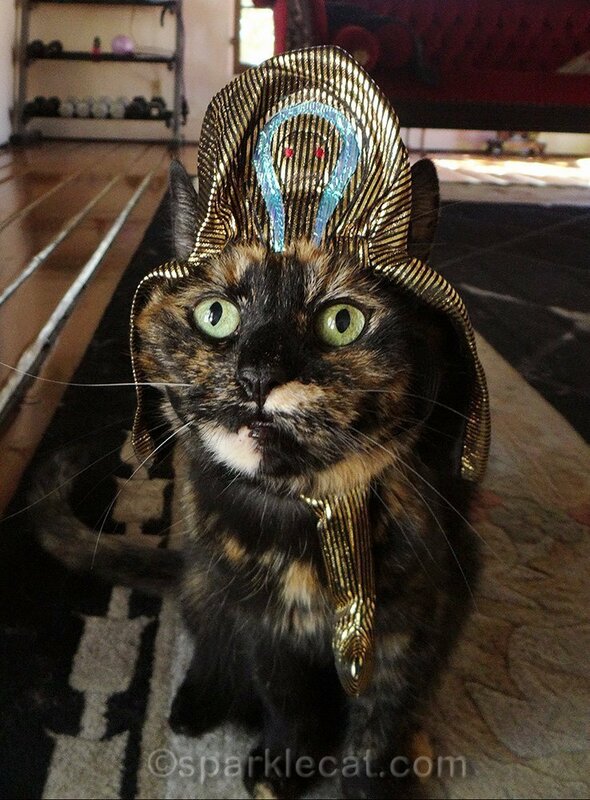 Binga makes a GREAT Egyptian goddess! Your blog posts are always hilarious. Little wonder you have been mominated for an award. I read them every day. 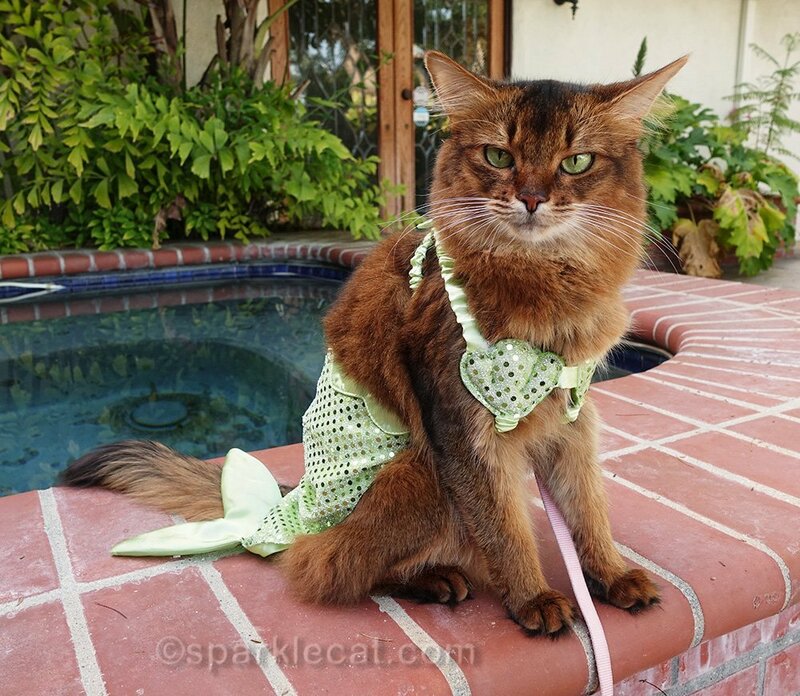 Both you and Sparkle looked cute as Mer-Kitties Summer, even if neither one of you liked it. Yoo bof look furry pretty in those costumes! 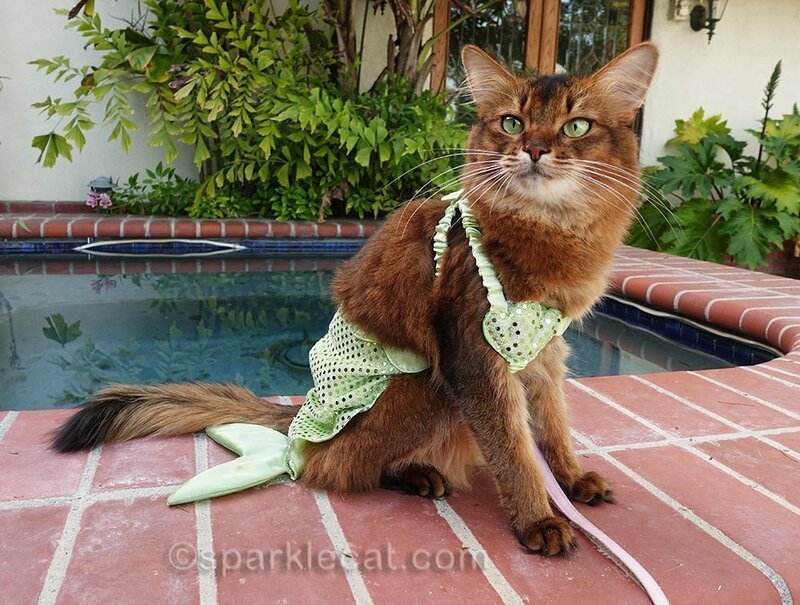 That mer-kitty costume would be difficult for any cat to pull off. Cute! Sparkle definitely did not look pleased. We like Binga’s headdress, even if she doesn’t. OMC!!!!!! MK and DK were laughing their butts off! Poor Binga! OTOH the costume DOES fit her royalty pretensions. Mol! And we loved Summer’s pic comment about the “bane”! 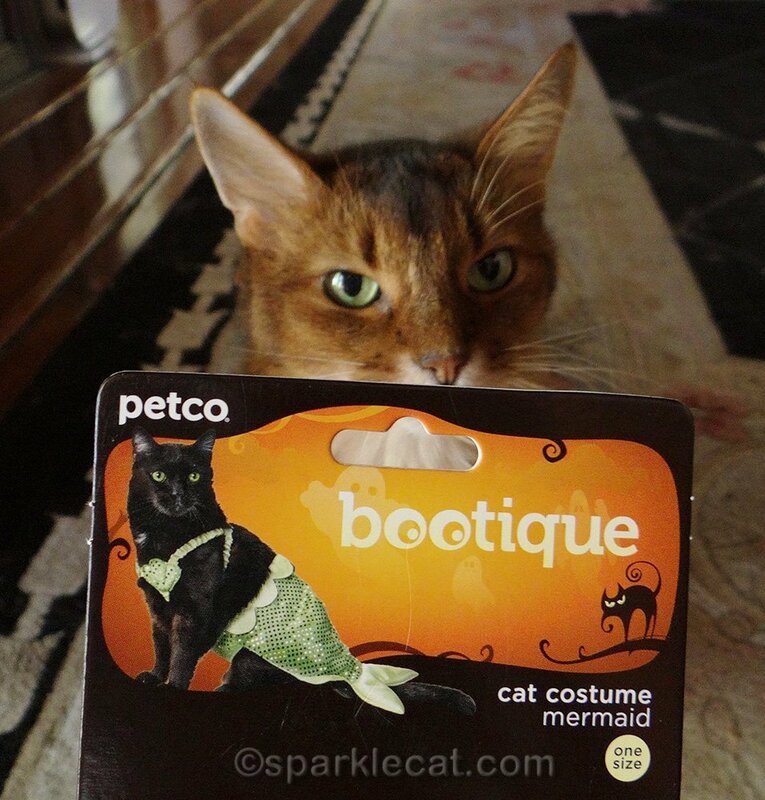 Definitely not the best costume choice for any kitty…Binga looks pawsome though! 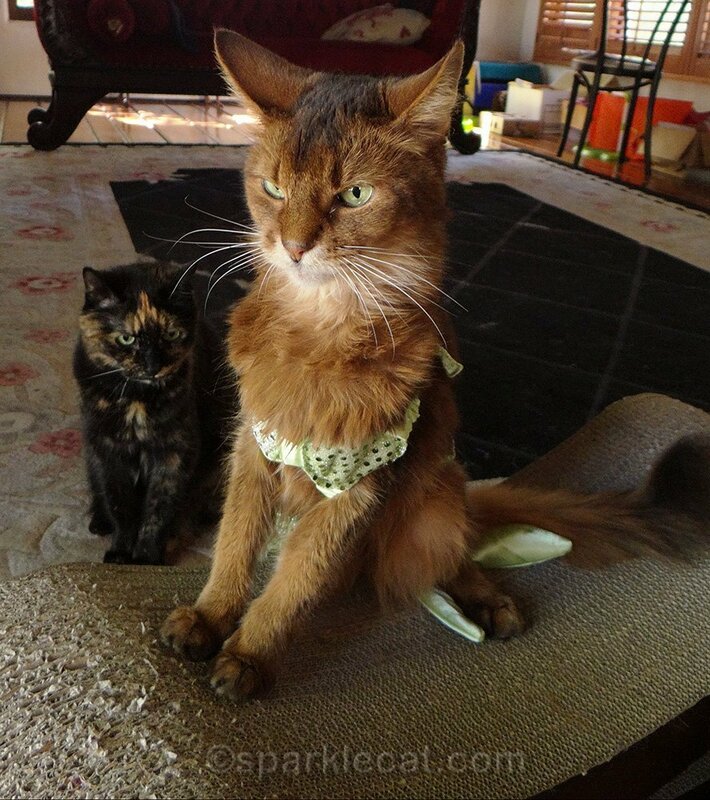 From the look on Binga’s face, she was getting treats for the dress up. Good girl Binga. Funny!!!! 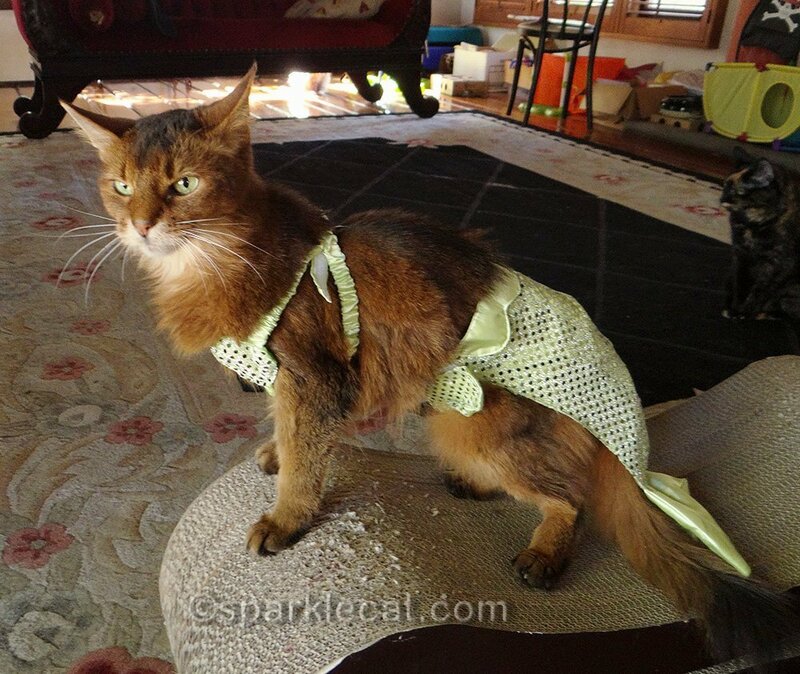 Binga’s costume is hilarious, especially her facial expression. That mercat costume is…unusual! It looks as if you liked it no better than Sparkle did. Binga’s was much better, after all the Egyptians did worship cats. MOL! Actually, I like Binga’s costume MUCH, MUCH better! Pretty Cats are Pretty Cats!! Summer, Binga, Boodie and Sparkle are Pretty Cats!! Oh, I meant to say…..I did realize that was Sparkle in the latter pictures. is an “interesting” costume – with the fish tail. MOL poor Binga REALLY does not look happy. Summer…Binga said she was just trying to help. Yes, that last one gave us the giggles too! That fish costume is silly… we eat fish! That looks like an Egyptian headdress on Binga!